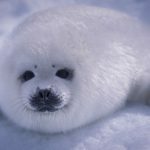 There are six species of true seals in the Atlantic Arctic; harbor seal, ringed seal, harp seal, hooded seal, bearded seal and grey seal. Harbor seals and grey seals give birth on land in the early summer and late fall/early winter, respectively. The others give birth on land-fast or free-floating pack ice during late winter through early spring (late February-early May) depending on the species. The Arctic consists of several nations and states that may or may not have legislation or guidelines for approaching wildlife. Ensure that you are aware of any legislation regarding seals in the area where you operate. Watching undisturbed wildlife in its natural environment is an unparalleled experience. To avoid disturbance when close to seals, you are asked to be considerate and follow these wildlife guidelines. Seals hauled out on land, rock or ice are sensitive to human presence. Noises, smells and sights may create a negative reaction. Use common sense and approach with caution and respect. Move away slowly if a seal shows signs of unease. Do not follow swimming seals. Harbor seals haul out on rocky shores and skerries. Do not make landings near such haul out sites. Keep a distance of at least 100 meters. If you encounter seals with pups on the ice, keep a long distance. Pups are often left alone when mother seals are in the water feeding. They are not abandoned and must be left alone. If seals approach the boat, put your engine in neutral to avoid harming the seal. If there are several boats, do not encircle the seal(s). On beaches, avoid getting between seals and the sea. 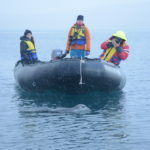 When viewing seals stay within the line of sight of the seal. Always let the seal see you. Signs of disturbance include: change in posture from lying to upright, frequent head turning, moving away from an approaching vessel, or a general increase in alertness or vigilance. Hooded seals have the shortest lactation period of any mammal – around 4 days – whereas harp seals follow closely with a lactation period of only 12 days. Following the pup-rearing period and subsequent mating period, the adult seals undergo an annual molt. 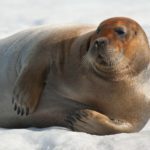 Many of the ice-breeding seals follow the seasonal retreat of the sea ice northward, although it is common to see both ringed seals and bearded seals hauled out on brash ice near glaciers fronts. Harp seals often can be found in large groups within the marginal ice zone or at its ice edges. Harp seal are very numerous with populations numbering in the millions in the North Atlantic. Svalbard is home to the northernmost population of harbor seals in the world, which is estimated to about 2,000 individuals. Hunting of seals is important to many indigenous peoples in the Arctic.